Abstract. Over the last few decades, numerous studies have investigated human impacts on drought and flood events, while conversely other studies have explored human responses to hydrological extremes. Yet, there is still little understanding about the dynamics resulting from their interplay, i.e. both impacts and responses. Current quantitative methods therefore can fail to assess future risk dynamics and, as a result, while risk reduction strategies built on these methods often work in the short term, they tend to lead to unintended consequences in the long term. 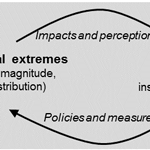 In this paper, we review the puzzles and dynamics resulting from the interplay of society and hydrological extremes, and describe an initial effort to model hydrological extremes in the Anthropocene. In particular, we first discuss the need for a novel approach to explicitly account for human interactions with both drought and flood events, and then present a stylized model simulating the reciprocal effects between hydrological extremes and changing reservoir operation rules. Lastly, we highlight the unprecedented opportunity offered by the current proliferation of big data to unravel the coevolution of hydrological extremes and society across scales and along gradients of social and hydrological conditions. How to cite: Di Baldassarre, G., Martinez, F., Kalantari, Z., and Viglione, A.: Drought and flood in the Anthropocene: feedback mechanisms in reservoir operation, Earth Syst. Dynam., 8, 225-233, https://doi.org/10.5194/esd-8-225-2017, 2017. There is still little understanding about the dynamics emerging from human–water interactions. As a result, policies and measures to reduce the impacts of floods and droughts often lead to unintended consequences. This paper proposes a research agenda to improve our understanding of human–water interactions, and presents an initial attempt to model the reciprocal effects between water management, droughts, and floods.